As one of the most enduring brands in North America, Elgin Sweeper joins an elite list of companies that have reached the century mark. This year, Elgin Sweeper, the leading manufacturer of street sweepers for general street maintenance, special industrial and airport applications, celebrates 100 years in business. "Considering that very few American businesses can claim such a unique distinction, we are immensely proud of our 100-year milestone, as well as our legacy of innovation and industry leadership," said Mike Higgins, vice president and general manager of Elgin Sweeper. "Through two World Wars, the Great Depression and significant economic challenges in recent years, the ingenuity and steadfast commitment of Elgin Sweeper's employees and dealer partners to serve our customers has been critical to our success." 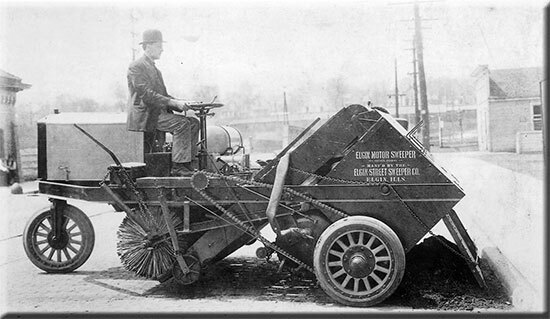 Driven by a desire to address the health hazards caused by streets and roads filled with filth and debris, pioneering automobile enthusiast John Murphy – who was also a resident and alderman of the city of Elgin, Illinois – brought his design for the first mechanized sweeper to American Tower and Tank Company of Elgin. After two years of trials with the original design created by Murphy, the company was ready to go to market. 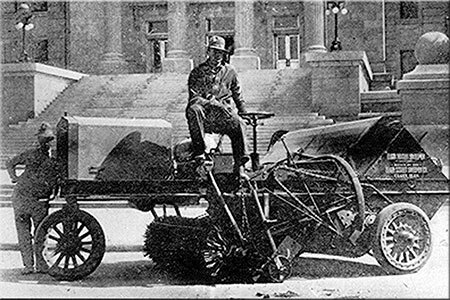 The first motor sweeper, a three-wheeled machine, was sold in April 1914 to the City of Boise, Idaho. By 1922, the market for the Elgin sweeper was so promising that the owners of the Elgin Corporation terminated their relationship with American Tower and Tank Company and the company became the Elgin Street Sweeper Company. Years later, the company incorporated as Elgin Sweeper Company. In 1982, Elgin Sweeper was acquired by Federal Signal Corporation, a leading global designer and manufacturer of products and total solutions that serve municipal, governmental, industrial and commercial customers. 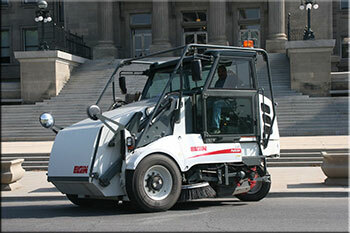 Today, Elgin Sweeper is a key brand of Federal Signal's Environmental Solutions Group. Elgin Sweeper still operates in Elgin, although in a much larger facility. Originally located near the Fox River in downtown Elgin, the company moved its operations in the mid-1960s to its current location in the southeast corner of the city. Elgin Sweeper employs approximately 200 people in factory-related jobs. Another 150 employees hold management, engineering and administrative positions at the company. Many employees have worked for Elgin Sweeper for up to 40 years. Over the century, Elgin Sweeper has also developed an impressive network of professional dealer partners Ð with more than 100 dealer locations around the world – who provide unmatched customer service and expertise. "Our dealers' commitment to customer service has been instrumental in developing long-term relationships with professional sweeping contractors and municipalities worldwide," Higgins said. Today, Elgin Sweeper is the best-known sweeper brand, not only in North America, but around the world. Murphy's original commitment to sustainability and the environment is evidenced in Elgin Sweeper's product line, which offers the latest sweeping technologies – mechanical, pure vacuum, regenerative air, alternative fuel and waterless dust control – to municipalities, contractors and industries. The company is at the forefront of the sweeping industry, advancing the use of cleaner, safer, and healthier energy technologies. Elgin Sweeper is also committed to taking advantage of leading technologies to provide exceptional sweeper performance while reducing the overall negative impact of air and water pollution to the environment. "Elgin Sweeper has a solid foundation for continued success into the next 100 years," Higgins said. "We will continue to revolutionize street sweeping, building on our legacy of innovation by developing groundbreaking technologies that deliver the performance, productivity and efficiency features our customers demand." This summer, Elgin Sweeper will host a special event for employees, guests and dignitaries to celebrate the company's rich history. An antique sweeper from Elgin Sweeper, manufactured in the 1930s, will also be displayed at the company's exhibit (Booth #801) at the 2014 APWA International Public Works Congress & Exposition this August in Toronto, Canada. For more information on the Elgin Sweeper product line, please contact your local Elgin Sweeper dealer, or visit www.elginsweeper.com to find a dealer near you. Sold and serviced through a network of more than 100 dealer locations worldwide, Elgin Sweeper products are the sweepers of choice for a variety of general street maintenance, special industrial and airport applications. With 100 years of experience, Elgin Sweeper offers municipalities, contractors and industries the most sweeper options in the country, using the latest sweeping technologiesÑmechanical, pure vacuum, regenerative air, alternative fuel and waterless dust control. Elgin Sweeper is a subsidiary of Federal Signal CorporationÕs Environmental Solutions Group. For more information, visit www.elginsweeper.com. Federal SignalÕs Environmental Solutions Group is a leading provider of a full range of Elgin street sweepers; Guzzler industrial vacuum trucks; Jetstream high-performance waterblasting equipment; and Vactor sewer cleaners and vacuum excavators for commercial, municipal and industrial customers. The Environmental Solutions Group also includes FS Solutions, which offers unsurpassed expertise and a unique breadth of environmental cleaning equipment, parts, rental, service and training to meet the needs of industrial cleaning professionals.